IGARD is one of the few centres in Singapore to be equipped with an Intuitive Colorimeter. 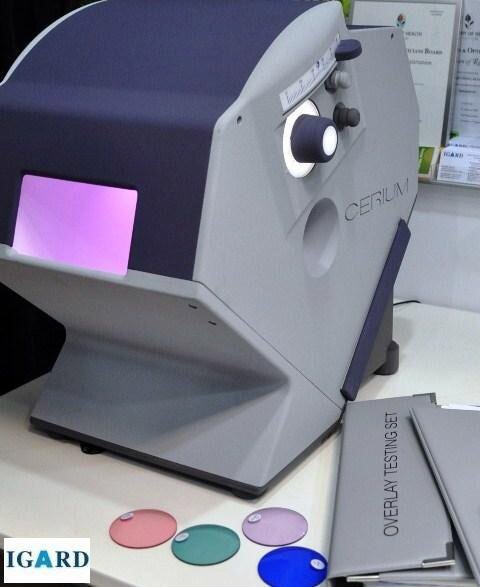 For many years, the centre in Singapore has established its expertise in Colorimetry through further clinical training in the UK. In the 1990s, Emeritus Professor Arnold Wilkins who worked at the British Medical Research Council (MRC) Applied Psychology Unit in Cambridge, UK, invented the Intuitive Colorimeter. This invention lead to an extensive volume of research as the Intuitive Colorimeter allowed a gamut of more than 6000 chromaticities through the adjustment of ‘hue’ (i.e. the colour), ‘saturation’ (i.e. strength of colour), and ‘luminance’ (i.e. brightness). The test allows each variation to be made continuously rather than discretely, and the perceptual effects of colour can be studied while the patient’s eyes are colour-adapted and all test surfaces are uniform. The spectral properties of the light entering the eyes closely resemble those when the coloured lenses are worn under conventional fluorescent lighting, even though additive colour mixture is used in the colorimeter and subtractive mixture is used for the lenses. This makes it appropriate for the test to be conducted on patients suffering from visual stress arising from Meares Irlen Syndrome (Scotopic Sensitivity Syndrome), brain injuries and photosensitive migraines. The similarity of spectral power distribution also means that individuals who have a colour deficiency can use the instrument. This level of precision ensures the patient’s optimal level of visual comfort.